IEA has completed the installation of a second standby generator at a major manufacturer in Postville, Iowa. The second unit is a 1,000 kW prime power rated diesel generator that had previously been in service at another IEA location and had been placed into IEA’s inventory. 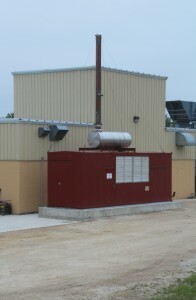 This second generator, along with a generator that was already in service, is used to facilitate the customer’s participation in Alliant Energy’s interruptible power program. This type of use is classified as non-emergency service. If a new generator had been purchased, it would have been required to meet EPA Tier IV interim emission standards, which would have made the project economically infeasible. Because this unit had previously been in service, IEA was able to retrofit it with a diesel oxidation catalyst (DOC) and avoid the expense of a TIER IV interim compliant unit, while still being in full compliance with current EPA emission standards. The customer will also use the unit to back up a second utility service that was not protected by the existing generator. Both units are owned, operated and maintained by IEA.